If you’re a follower of the blog, you’ll remember that when writing my 2014 retrospective I’d said the minimum goal I’d like to achieve was to get at least one person that I hadn’t previously met out on a ride. Well, I am pleased to say that this, somewhat unambitious goal,was accomplished on the very first monthly ride of 2015 (only the second ride so far in the club’s short history). Not only did we get one new recruit but there were two, hoorah! I’m mightily impressed that we managed to get a couple of new people out at this time of year, as truth be told I held very little hope in tempting people out in the wilds of the British winter. 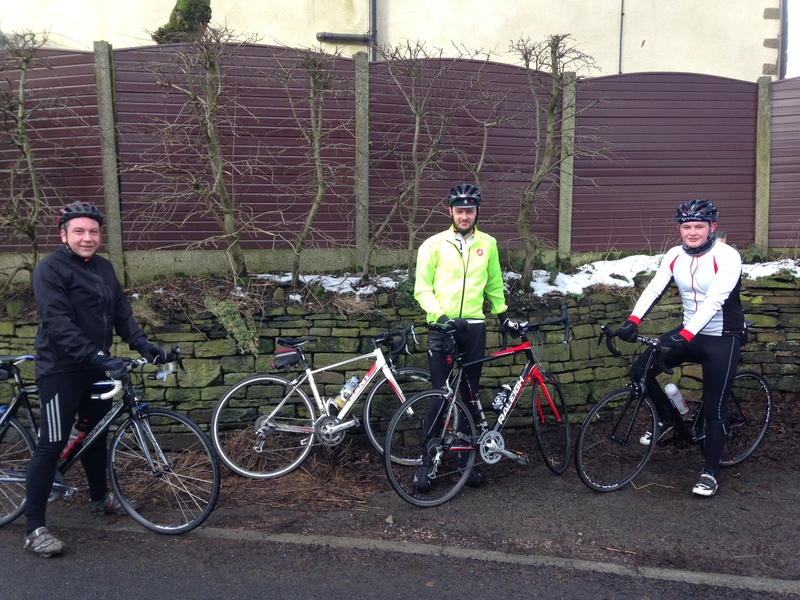 As for the ride – On 24th January, my friend Rich and I headed out to meet our new compadres: Josh and Simon. We met at the front of St Mary’s Flower Park on Bury New Road and made our introductions. Off we headed up Bury New Road – it’s unfortunate that most routes start this way – but we were soon branching off onto the quieter roads that lead up through Radcliffe towards Ainsworth/Breightmet. It was nice to chat as we rode, it’s one of the things I’d been looking forward to; to chat with new folk while taking in the local surrounds on the ol’ pushbike. We took turns to switch around in our mini group, all making sure we chatted with one another. It didn’t take long for Josh to ask me, “Will there be many hills?”. I smirked and said “Yes, a few, sorry”. Josh been a mere 20 years old, a cyclist who cycles around 25+ miles per day for his job, was never going to have any issues up the hills was he? No. He’s either not too bad at them or he’s got a great poker face. The gang. Craig not pictured, my bike is my stand in. That being said, we all managed quite well. Especially considering this was a mere few weeks since the Christmas splurge. Simon, bless him, was also attempting the age old hangover cure of exercise to try rid himself of the cobwebs of the night before. He did a bloody good job of it as well. While not the hilliest route you’re ever going to do – around 1,600ft in 21.6 miles – there’s enough short, ‘punchy’ hills in this part of the world, as you head north and slightly east up into the Lancashire hills, to keep even the fittest cyclist on their toes. Nowhere was this illustrated better but at the two Harwood Road climbs around Tottington. The first way, heading up towards Tottington from the Harwood golf course is short but has some really steep sections, my Garmin didn’t seem to budge much from around 13% in what seemed like years. In reality it was yards but it is a tester. The other way, as you come off the high street in Tottington to head back up Harwood Road to double back on yourself, starts of like Paris-Roubaix with the quality of the road surface. This makes a pretty steep little hill all the more unpleasant. 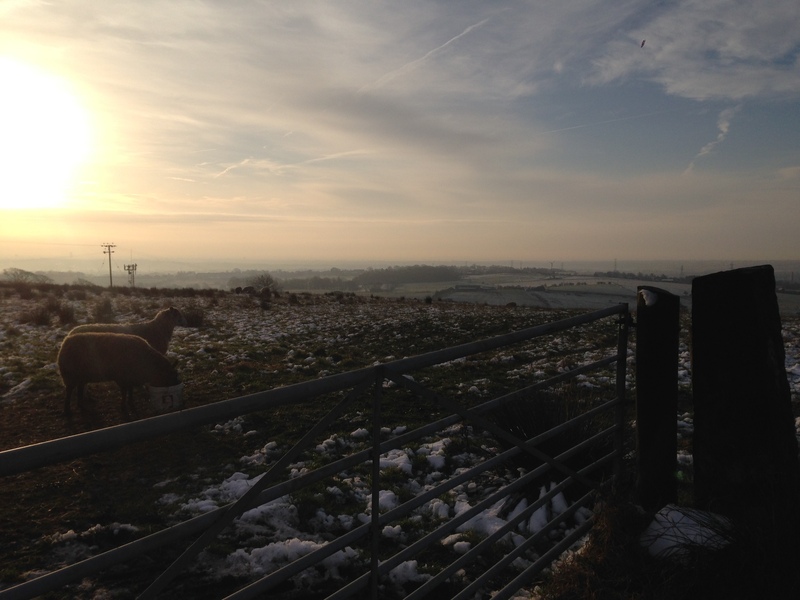 For all the aforementioned ‘unpleasantness’ (I secretly love the punishment), the views up around Harwood -in fact all around this area of the North West – are what really make it such a pleasure to ride around here. Just cop a load of this view from the top of Harwood Road after you pass the golf course. After the hills came the descents and the flat parts. We cruised along at a steady pace, chinwagging as we went and before you knew it we’d clocked up 21 miles and our ride was complete. There’s something I love about sharing a ride with people generally, your own little piece of history that only those on the ride share. When riding with people you’ve never met, in just a couple of short hours, it’s like you’ve built a little bond with someone and makes you feel as you’ve known the people much longer than you have; that’s not quite the same as just going down the pub. Maybe it’s down to the fact that you’re asking each other if you’re okay, waiting for people who might be struggling, looking out for each other on the road that makes it this way. Whatever it is, it’s just another thing I love about cycling – meeting new people and sharing the ride with someone. You can see a link to the Strava GPS map here .